I am minister at Christ Church, Hipperholme and Northowram within the Circuit, together with Heywood United Reformed Church, Northowram. So I get called on by two denominations. Plenty of variety then! A Kentishman, I grew up in a Congregational, later United Reformed, Church. I took a degree in Law and then trained for the United Reformed Church Ministry in Oxford, eventually arriving in West Yorkshire via Wrexham, South Manchester and Mid Staffordshire. This is not the most direct route, but I have been blessed by good people and good learning experiences in each pastorate. I have one daughter who lives away from home and two cats very much at home with us. When time – and cats – allow, I enjoy cooking, swimming (to control the effects of eating what gets cooked), crosswords, travelling to new places and back to favourite places, and stories of many sorts; history, theatre, films, crime novels and, of course, Bible stories which have been part of my life for as long as I can remember. 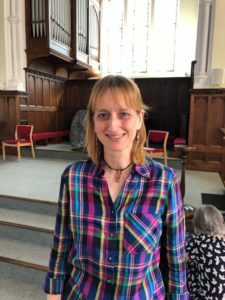 I am a member at Christ Church LEP from a United Reformed Church background and currently a serving member of the Leadership Team and Church Secretary. I am also the ‘Captain’ of our children’s Group, Pilots, which runs on a Friday evening during school term time. I have been ‘Captain’ for over 25 years now and recently received a ‘Long Service’ recognition award. I enjoy planning the weekly sessions. Outside of church life, I have worked for the same company for 25 years. When time allows, I enjoy reading novels, shopping (retail therapy), spending time with my nieces & nephews and meeting up with friends. 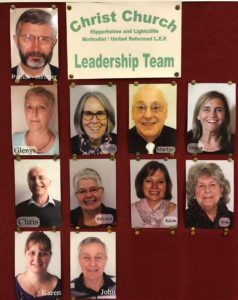 Christ Church has a Leadership Team which combines the functions of URC Elders and Methodist Stewards and Councillors. We are the managing trustees of Christ Church and as such are responsible for all matters concerning Safeguarding, Finance and Property.